Organic PhotoVoltaic (OPV) devices are undergoing a steady revolution in efficiencies and stability. The 10 % and 10-year barriers for lab-scale materials have long since been broken. A massive challenge remains, however, in transferring this exciting technology to the market place. For roll-to-roll printing, polymers tick all the right boxes, including their applicability to ink-based technologies. But large modules (> 50 cm2) have efficiencies of around 6–8 %,[1a] and when going to very large scale modules (> 1 m2), 3 to 5 % is more common. Block copolymers (BCPs) are known to improve the structural strength and organisation of polymers. When cast from solution, they form microphase domains of the order of tens of nanometers. This scale is excellent for controlling excitonic formation and charge transfer through devices. While BCP devices are delivering around 3 %, it is expected that numerous parameters can be used to allow a catch-up in efficiencies. Furthermore their use as additives is eliciting attention. Specifically, this lecture looks reports on work incorporating fullerene into main-chains and block copolymers and considers their use in OPV devices. 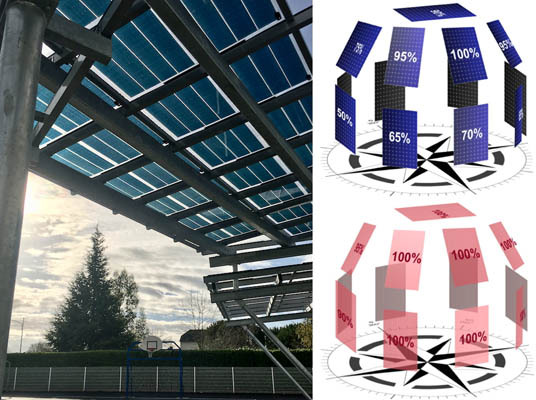 The second part of this lecture gives a general update on the community-scale OPV installations (ca 3 kWp) in Adour Madiran. Of particular note is how this project seeks to exploit the excellent oblique angle light recovery of OPVs, and their facile integration into buildings while respecting local planning laws and cultural needs (Figure 2). Figure 1. 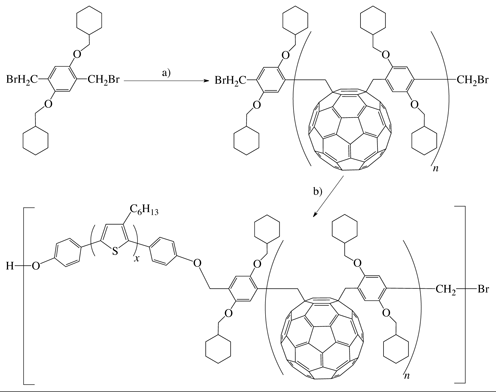 Synthesis of a poly(fullerene)-based block copolymer using a) ATRAP, and b) Williamson chemistry. Figure 2. Left : OPVs in a 2.8 kWp grid-connected OPVIUS installation in Pontiacq (France). Right : Alignment effects in Si-panels (blue) and in OSCs (red). 2. S. Berny, et al., Adv. Sci. 2015, 1500342. 3. P. D. Topham, et al., J. Polym. Sci. B. Polym. Phys. 2011, 49, 1131. 4. (a) M. Raïssi, et al., J. Mater. Chem. A. 2017, 5, 7533. (b) D. Bégué, et al., RSC Advances 2016, 17, 13653. 5. H. Erothu, et al., Macromolecules 2015, 48, 2107.